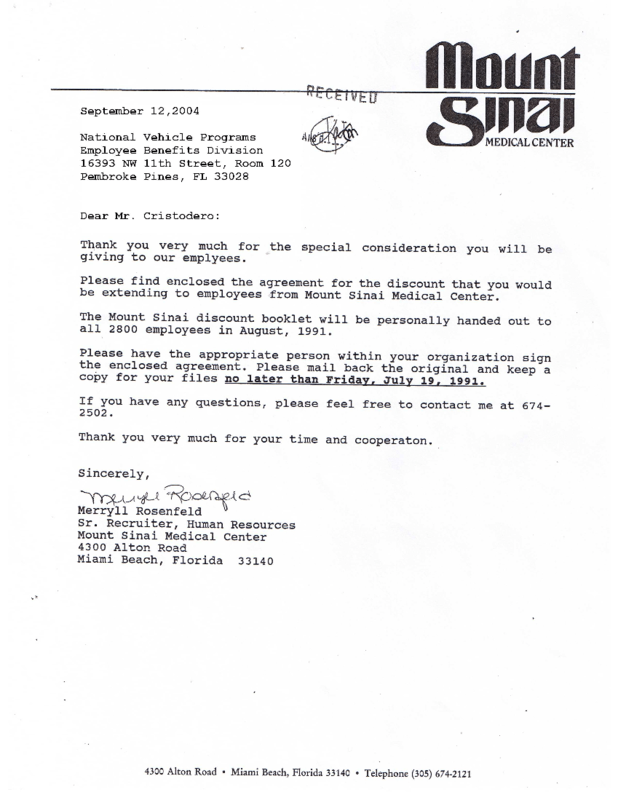 Here is the acceptance letter to the National Benefits & Vehicle Programs from Mount Sinai Medical Center in Miami Beach, Florida. Please click the image below to see the full size version. Here is a transcript of the acceptance letter from Mount Sanai Medical Center. Thank you very much for the special consideration you will be giving to our employees. Please find enclosed the information for the discount that you would be extending to the employees of Mount Sinai Medical Center. The Mount Sanai discount booklet will be personally be handed out to all 2800 employees in August, 1991. Please have the appropriate person within your organization sign the enclosed agreement. Please mail back the original and keep a copy for your files no later than Friday July 19, 1991.